Without tools he is nothing, with tools he is all. 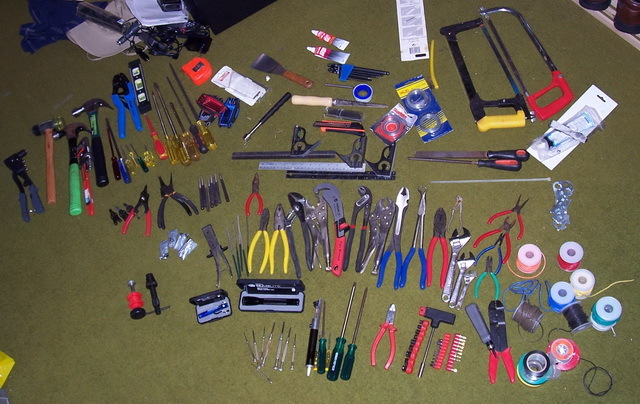 A suitable toolbox is a important as the tools it will hold. I've got two main toolboxes, one small and one large one. They've grown a lot, with large tools in the small and small tools in large... it was time to empty all their contents and refile them. I'm back from a quick getaway with Tracey. It was a long time since we'd had a holiday, and we quickly organised a trip to Tassie. Fly down from Sydney, grab a car, spend nine days roaming. Initial accomodation booked, and no solid plans after that. Handily, my mate Pete had the Lonely Planet Tasmania Travel Guide, and before departure Tracey had filtered thru it and found items of interest. 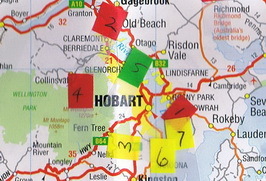 She then marked these items on an NRMA map I had... with little sticky tabs... numbered... and typed and printed an index. Yeah, she's a big dork (but that's part of why I love her). Tracey's number one attraction was Tazmazia. I'd never heard of it, and thought I'd like a map. I can't help being a nerd. I initially didn't see the attraction (too much Doom), but once there we both had a ball. I may have had an advantage over Tracey (too much Doom). My verdict on Tasmania? I love it. The whole state is like a small country town. If I need to visit Sydney, it's only a 90 minute plane flight. I think I could live there quite happily... (winter might get a little chilly).